Since my last post, I have welcomed two incoming farm residents, heard of a surprising demise, racked up expenses for several veterinary visits, and I am considering renaming Carl Sagan the Guinea pig “Methuselah.” The new washer has astonishing capacity, making Dobby’s daily washing a breeze, and his gigantic blankets drop into it like the Enterprise entering a black hole. 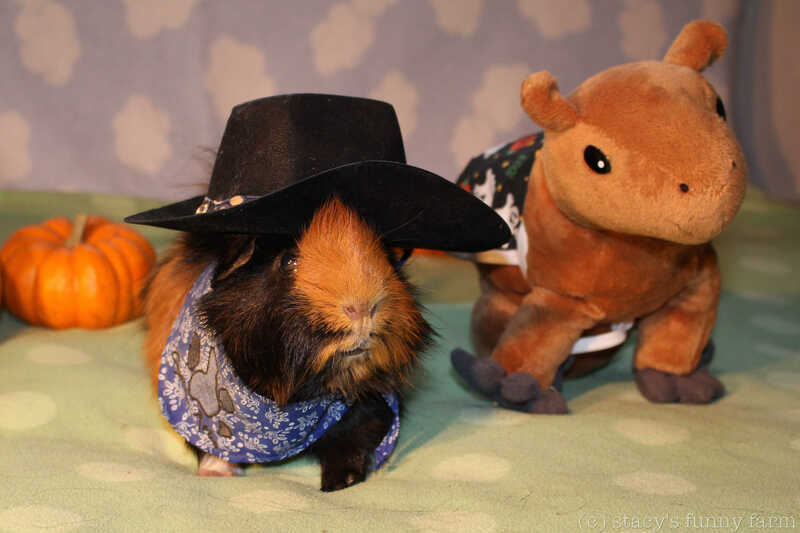 Squirrel is my new Guinea pig, and working him into the Dude Ranch is exciting. He came from a nearby rescue and had not found a permanent home. Until his well-pet check, he lived quietly in his own cage. He’s a friendly boar, leaning out of the cage, interested in anything coming in through the door. Digging through his vegetable dish, he runs off with the carrots. Eventually he tastes everything and then the dish is empty and he’s back to begging. Squirrel, foreground, in his isolation cage. Dude Ranch behind, Carl barely visible in a pigloo. The veterinarian agreed with my age estimate of 2-3 years, well under the 5 years I was quoted. This means he is still young enough to neuter, and that little surgery took place last week. He’s so over it, raring to go again. Because, you see, this one is a maniac. I don’t know where that quiet one went that I adopted, but I don’t think he’s coming back. Once Squirrel was deemed healthy, I took the next step of partitioning the Dude Ranch in order to introduce him to the herd. Ancient Carl is too fragile to live with anyone new, but eventually, Stevie Ray will appreciate a companion. They can live side-by-side until I am certain they will get along. So I put little Squirrel into his side of the Ranch, and he went wild! He grabbed the partition with his teeth and shook it until all the water sloshed in the bottles and food started to fly from the food bins! Wow! Stevie Ray and Carl both came over to investigate, and I realized how close their tender little ears were to the toothy fury that was their new neighbor! Out Squirrel went, back to his old cage. It was quiet again. I put a double divider in, a space between them, a demilitarized zone, so to speak. Squirrel went back in, the fury ensued, the cage shook, the boys came to investigate, and Squirrel was airlifted into his old cage. Wow! I continue to maintain that I am smarter than a Guinea pig, smarter than a capybara, even. Because if I’m not, I can’t do this. So I thought about it overnight and the next day I implemented my solution: I lifted the wire cage top off of Squirrel’s cage, plopped it into the dude ranch, thrust him in with his food dish and hay box, and stood back. He calmly walked around his familiar territory and started begging for vegetables. Squirrel is in the white cage-within-a-cage at the far end of The Ranch. The Bartender glanced in as he passed by. I’m still smarter than a Guinea Pig. Squirrel completely calmed down within his familiar enclosure. Yes, I suppose so. A couple days later I lifted his wire cage jail out of the Ranch, and Squirrel barely noticed. I left the demilitarized zone in place, though. Carl is now too fragile for even indirect contact, even though Squirrel has calmed down a bit. Stevie Ray and Carl are still safely separated from the maniac, though Squirrel hardly ever rattles the divider any more. Blur the banty hen came to me as the result of a failed backyard chicken experiment. Her buddy was taken by a raccoon and her owners threw in the towel. She was too noisy: lonely for chicken friends. She is absolutely minuscule, about the size of a pigeon, and I can hardly wait to see her eggs. To tell you the truth, when I saw her I was concerned that my bigger hens might not accept her, or that the cats might take an unhealthy interest in her. I put her in the infirmary with my handicapped hen, Lula, and they have bonded and are nearly inseparable. While Ping (the tiny new duck) was sequestered in the bully pen, they spent their days with her. They shared the safety of the apple tree pen during the afternoon garden parties. Now that Ping has been integrated with the other ducks, Blur and Lula continue their friendship wherever they are. Princess Blur seems to feel she is in charge, and knowing the routine runs over to be picked up when we are changing venues. She can walk, but Lula can’t, so they both have to be carried everywhere. Lula (black) and Ping (white), Dobby the capybara, and tiny Blur just behind him, in the apple tree pen. Princess Blur, the banty Mille Fleur hen. She might be 6″ tall. The Bartender looked a bit panicky when I said that out loud, so I won’t mention it again and we’ll see what happens. Ping the duck and Cubicle the goose are friends. Shamrock is just beyond the top swimming pool step, and Carmen Miranda the muscovy is beyond him. Ping, the little white duck, has settled in with the flock and follows the drakes everywhere. I’m not sure why they haven’t noticed how cute she is. She and my goose, Cubicle, have long amicable conversations, and I think she is getting some good advice. Or maybe she’s hoping to interest Ping in Shamrock, the relentless drake who shamelessly follows Cubicle everywhere, to the annoyance of her mate, Norman. Dobby plays hide and seek in the front yard. Romeo, who went to the most fabulous pond imaginable, had a good month there and then suddenly wasted away before there was time to see the vet and he’s gone. Our ten cent diagnosis is hardware disease, a peril I have lost several Muscovies to. I feel badly that he probably ate some ugly junk here only to die of it at his new home. We will never know, but I guess it’s time to sweep the farm with my magnets again. Pouffy Man. We’re working on a new trick. Do you think he can get pouffy on command? Carl Sagan (Methuselah) has again made it to his birthday month of October. Born in 2006, that makes him – YIKES! -ten years old! Sadly, he looks all of his ten years, and he is fading fast, but his appetite is youthful! He is my last goodnight, and the little pet I check on first thing every morning. 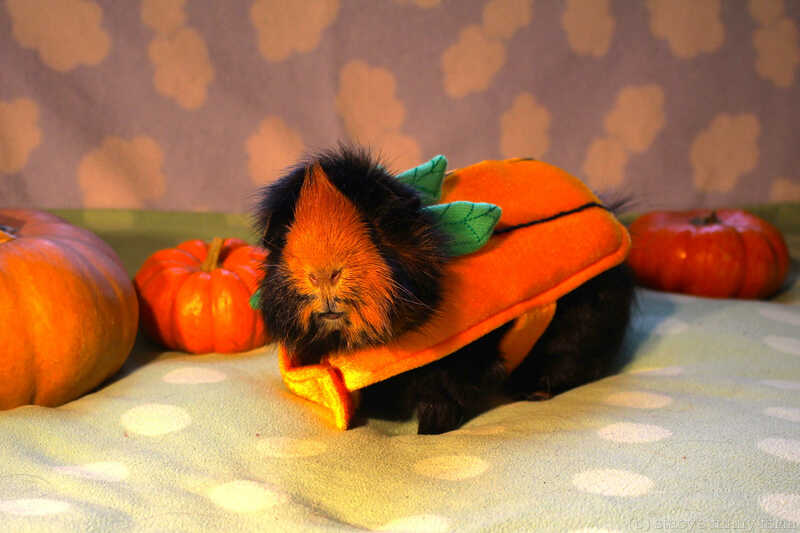 In Guinea Pig years, he’s about 100. You are a champ, Carl! Stevie Ray and Carl Sagan. Ha ha, can you tell which end is which? In other news, Dobby’s presidential campaign has stalled somewhat. He is bitterly disappointed that he wasn’t invited to the first debate, but is now complaining that he was unable to prepare due to an unexpected nap computer glitch. Maybe he’ll get off his throne and do some campaigning, maybe not. We’ll see. In the Pacific Northwest, winter seems to drag on and on and on. Summer is simply a brief, shiny, and distant memory. We have four more months of very iffy weather before “summer” which is unreliable until after Fourth of July. For now, I feed the ducks and chickens in the morning, then wash and dry my rain-soaked jacket in time for the afternoon Garden Party. It rains ALL THE TIME, there is slippery black mud everywhere, and even the ducks are wet. Dobby, supposedly a rainforest animal, refuses to do his “business” out in the cold, windy, relentless downpour. It’s just not right. Lots of fun coming up before summer, though. The ducks are starting to joust and I’m wondering how soon the Bully Pen will have to open for business. My fabulous volunteer, Jillian, needs to adjust her schedule around tennis practice. 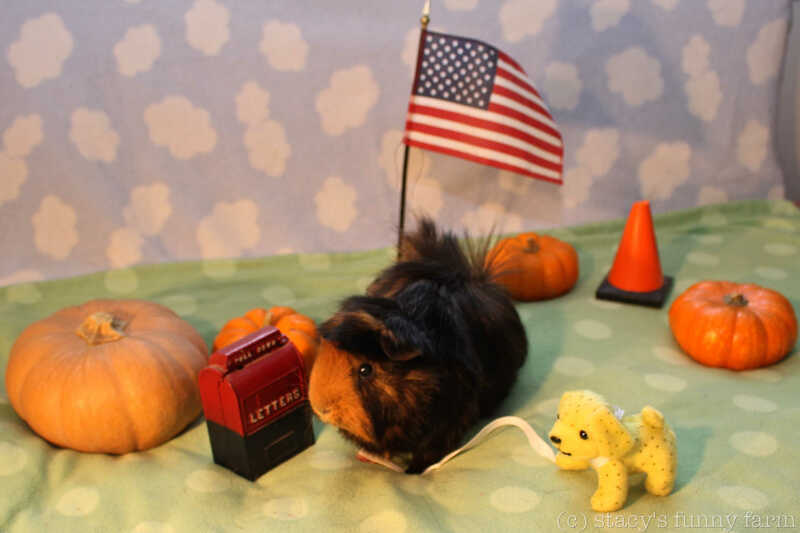 I still can’t believe she offered to come on Guinea Pig Cage Cleaning Night! We were able to clean The Dude Ranch plus the two rabbit boxes in a New York minute! It’s so nice to have help for the “less fun” tasks! Unfortunately, we forgot about Dobby’s extra Jillian Corn, and when she went to say goodbye to him, she noticed that he had registered a complaint IN HIS POTATO BOWL. Ugh. Sorry, no photo. Part of the aviary fence is slowly rotting, as everything does here in the Pacific Northwest. Between the time when I counted rotten boards and showed my friendly neighbor where to install the new ones, another very suspicious hole had opened up. We hastily gathered up some plywood to patch the holes from the inside, and he can now replace the boards at his leisure. One week later, the suspicious hole resurrected itself, this time through the plywood! I set a 2×4 on the stringer and braced it with a CMU half block. Very late that night as I was readying Dobby’s kitchen area for the morning onslaught, a possum sauntered by, so close to the glass door he nearly brushed against it! So, yes, a suspiciously possum-sized hole. I kind of wondered why egg production had dramatically dropped off the last couple weeks. Thank goodness he didn’t go after the hens. And that reminds me I better check the hole from the entry-side of the fence, and maybe store a few rolls of chicken wire there. I’ve already directed the neighbor toward my stash of sheet metal. My little hen Lula, who has been on Metacam just over a year now, is looking better day by day. Miraculously she has feathered out beautifully and seems to be putting on weight. Last night I found her roosted way up high with the other girls. I never thought I’d see her back up there, she has been roosting on a low laying box for months and months. The sun came out for about 5 minutes last week, and I saw her standing tall and enjoying it. It won’t be long before she’ll be joining the others for the Garden Party. It has been a while since I heard from Honey Bunny’s owner, and so it goes. I really don’t like to take “fosters” because they are exactly as much work as full-time residents. I’m glad I was realistic about Honey’s future here, but she is probably the most “spirited” bunny I’ve known. She would be a more suitable guest if she’d refrain from leaping up to the bookshelves, but it’s hard to stay mad at a bunny doing figure-8’s around your legs! I wasn’t busy enough, so I am now officially not retired. Sixty-four is an odd time of life to start a new career, but my volunteer status no longer adequately describes my activities, so I have been hired. Coincidentally, my wildlife photography, my non-stop blogs, and my stunning cinematography have been derailed. The dramas have no respect, and continue to unload at an alarming rate. Currently, the blog-waiting room at the Stacy’s Funny Farm Station is taking numbers, but all of the clerks are out to lunch. For instance, there is still a rabbit at large in the guinea pig room. I am losing confidence that Honey Bunny will be reunited with her owner in the near future, but she is a lot of fun for now. Other than the fact that she has started to mark the carpet. My own Bonnie Bunny has previously attacked a rabbit- her own sister!- so I don’t dare introduce them. Snow White, the dove, is finally perking up. I had brought her inside and she did well at first but then languished. I still don’t want her to have direct contact with her daughter, The Pirate, until I am certain she is healthy. For the past four days, I have been wheeling her cage into the kitchen so they can “flock,” and they are eating together (from afar) and Snowy is suddenly showing signs that she will completely recover. Next I will let them interact, supervised, and determine whether they want to share a cage. Snow White probably thought she was doomed to flock with guinea pigs. Oh, the horror of it! 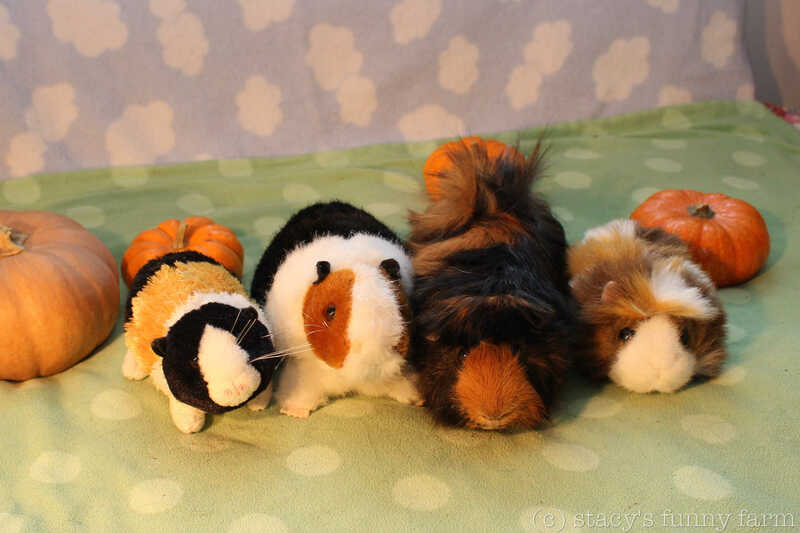 In fact, the guinea pigs are a fine little herd. Carl’s eight year old legs still scurry with the youngest of them. He honestly doesn’t seem any older than the other dudes. Speaking of old dudes, my antique cockatiel, Jorge, still occasionally falls off his perch onto the padded cage floor. I’m beginning to think he is a LOT older than the sixteen years I know about. I’m his third owner, and he’s been annoying me here for ten years. The new hens are settling in, laying eggs, begging and underfoot. The flock dynamics are fascinating: little Bianca is now shunned by the two hens she arrived with, and old Jello seems happy to have her as a new companion. And yet, the roosting positions vary from night to night, with Bianca randomly sleeping near the two and then Jello. Little Lula sleeps below, but still manages to get off the ground. She has been on Metacam for a year, and if she ever dies we might discover what her problem is. She is a sweet happy hen, comes when I call her each morning for her medicine. We had 11″ of rain in January, almost 1/3 of our yearly rainfall. Even the ducks are sick of it. Norman’s feathers are in poor condition, and the Muscovies look pretty bad on wet days, too. 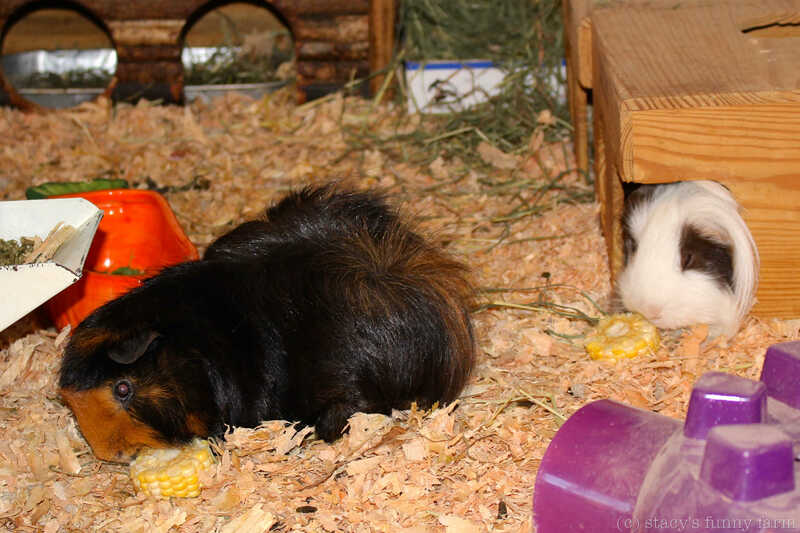 They have a heat lamp and whole wheat and cracked corn treats, but we’d rather have some sun. Quasimodo the turtle has been out a few times this winter. He’s been here since 2009, and each winter I wonder whether I should bring him in or let him hibernate. In this photo you can see the bulge at his right cheek, a calcium deposit he’s had since before he came here to live. I feed him when I see him, but he really isn’t interested in eating during winter. Dr. Pepper has emerged a couple times, too, but not for long. Lotsa mallards . . . oh boy, look at the steps. Will they make it to summer? The crazy wild mallards are proliferating. There were 26 one afternoon last week, right at the time of day my flock generally emerges for the Garden Party refreshments. A couple of the mallard ducks march directly into the aviary, turn right at the turtle tank, enter the barn, and help themselves to the poultry food! I now have to make a sweep for mallards before I secure the gate for the night. One morning last week, a drake surprised me by flying off the roof onto the ground in front of me as I walked out with the breakfast treats. Entering the aviary I was greeted by a female mallard, merrily swimming in the duck pond. She was reluctant to leave, though her drake was mighty relieved to have her released. My tomcats vacillate between boring and completely frustrating. Grover has decided to discover whether it is possible to actually perish from hairballs. Kitty Hawk is easy enough to handle that I occasionally grant him the privilege of walking the circuit around the house. Those days are over as he apparently strayed across the street. I figured that out when I heard the distant cat fight- who could that be? Dobby, my precious angel, has been saving “gifts” for me, letting loose in the kitchen as I return home for school. He’s so thoughtful. I keep telling myself it’s the weather. You might think a rainforest animal would like the rain, but no. He seems to disapprove of rain, though honestly, in winter he disapproves of almost everything except corn-on-the-cob. There has been a tiny visitor at our front door, and I have almost stepped on him twice. The second time I brought him in for a photo shoot. It’s spring when wooly bear caterpillars appear, right? Summer is surely coming! Oy vey, December was full of glitches. The month is nearly gone and and in spite of all the schmoozing, or maybe because of it, the blog posts are just not happening. The Funny Farm has its ups and downs but still provides sanctuary for about 50 animals. A couple are pets, like Dobby, but most are rescues. I don’t think I need any more actual “pets” with so many second-hand pets in need of homes. Cubicle is glad that the Prince of Schlock is out of the aviary for a moment. The story of Leonard the Koi is still unresolved, and I don’t know whether he will ever come here or not. Or when. Once he is settled, the goldfish will come here. I’m not holding my breath, but nothing surprises me any more. Carmen Miranda poses, Romeo flashes his crest, and Lula takes refuge under a bench. Winter can be rough but at least Romeo, the putz, behaves himself. Lula hen has been on Metacam for almost a year now, and is much improved since last winter. The vet isn’t certain what ails her, but the meds are effective for all of the possible diagnoses, and she doesn’t kvetch about it. When I call her, she comes over to get her medicine. We can’t eat her eggs, but she doesn’t lay many any more. Kitty Hawk (face in food bowl) and Grover, showing off their tipped left ears. The tomcats, Kitty Hawk and Grover, are busy and happy. Unfortunately, the vermin they chased from my aviary had the chutzpah to take up residence in the crawl space of my house, and were checking out the basement and attic, too. That is a fun holiday project I would rather not have to deal with. Prince Dobalob strikes a pose. On the bright side, Dobby has new hens! They arrived at dusk so they went straight into my infirmary. He got pouffy every time he saw them for the first few days. Behind the fence: Conchita, Adelita, and Bianca. This side of the fence: Jello. The bully pen is available this time of year, so the hens spent their first few days in there. Jello the hen was not nearly as impressed as Dobby. A little bit pouffy about the new hens. Seriously, The Prince was very excited about his new hens. They haven’t really noticed him yet, though he’s hard to miss. They will soon discover that he is a klutz and will become more wary. Bianca likes to sleep UNDER Adelita and Conchita! One evening I discovered they had decided to perch on the fence, in the rain, within stranglehold distance of the overhead screening. Raccoon bait. Back to the infirmary for the night. I didn’t get the door quite shut and found them wandering around the barn in the morning, sticking their schnozzes into everything. Nobody was paying any attention to them so I decided to leave them out with the general population. Bianca is a banty Americauna and lays these crazy blue eggs. She was very quick to discover the laying boxes and kick-cleaned them out for future use. The eggs are a pale robin’s egg blue. The next night I shlepped the hens into the infirmary to roost before they could do anything foolish. Dobby was fascinated by the roundup and helped me out by laying right smack dab in the most inconvenient location possible. The Dobster is serious about his hens. The following day, Bianca cleaned the shmutz out of a box for Conchita. Cleaning up is her shtick. Conchita and Adelita are Welsummers and lay chocolate-brown eggs. I finally figured out that Adelita has been laying her eggs way over there → away from the boxes in a hard-to-reach spot but I’m onto her now. Suddenly the next night, the three new hens decide to roost up with Jello the hen. There are several configurations possible, though Jello (aka J.Lo) prefers that they roost way over there ←. It seems to change every night but they aren’t out on the fence in the rain any more. When I took my volunteer out to show her the new hens, we discovered one of the doves at the bottom of the cage. She is a weak bird, Pirate’s mother in fact, and spends a lot of time on the ground, but seeing her there, I realized I had not seen her up on a branch for a couple days. I tucked her into my jacket, and as we finished up outdoors, I went through my spiel on why new birds are put into quarantine. Sure enough, once I brought her in and looked at her with my glasses on, she went straight to the dusting bin. One week later, she is looking pretty clean. She is still not recovered enough to kibbitz with her daughter, though. Snowy dove shares upper space in the guinea pig room, while another transient shares floor space. 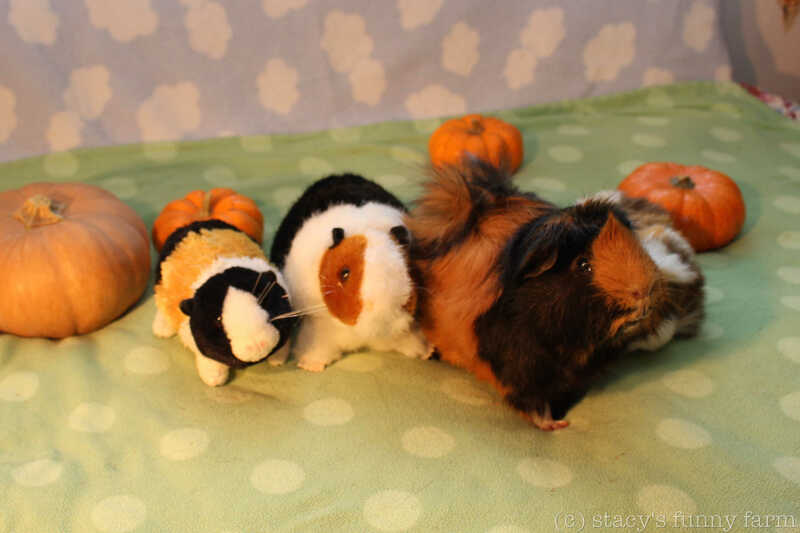 Handsome Carl, Fred in the box, and Stevie Ray playing turkey in the straw. Honey the bunny is staying with us while her owner is in transition. Unlike my own Bonnie bunny who is afraid of her own shadow, Honey excitedly examined every inch of her space, tasting, digging, and testing the traction of the carpet. I followed her around, securing barricades, tucking away wires, and strategically locating new toys. Honey poses between her litter/hay box and her night cage. Honey is friendly and trusting. She has very tidy habits, and quite a healthy appetite! Maybe that’s because she was once a feral stray. From the first day she would run straight up to me, begging for treats, and she still runs around my feet when I am in her space. Now that the novelty of her situation has passed, she is just as likely to flop over and stare away from me in the standard rabbit mode of disapproval. Will Honey bunny ever meet Bonnie bunny? Bonnie has a history of aggression toward other female rabbits, so I just don’t know yet. Honey is only here for a short while, but you never know, do you? Hey Carl! Come over here! Let’s do an 8th Birthday photo shoot! We don’t know the exact day, but you were born around Halloween. Okay, we can wait a couple minutes. I’ll get the camera set up. Very cute, but I had something fancier in mind. I do appreciate that you picked out a nice orange t-shirt to match the pumpkins. Ha ha, nice. But everyone has already seen that costume. Don’t you have something else? Ah, yes. The hat I brought you from Venice. You make a very cute gondolier! And here’s the sombrero I brought you from Zihuatanejo, Mexico! That is a great color on you, Carl. Where did you find that lei from Hawaii? I don’t think that belongs to you. You’re right, though. It’s way too small for Dobby. Now we’re talking! Sheriff Carl Sagan and his horse. Wait a minute, is that Capycoppy? Taking your dog for a walk down to the mailbox? Looks like you dodged the rain. 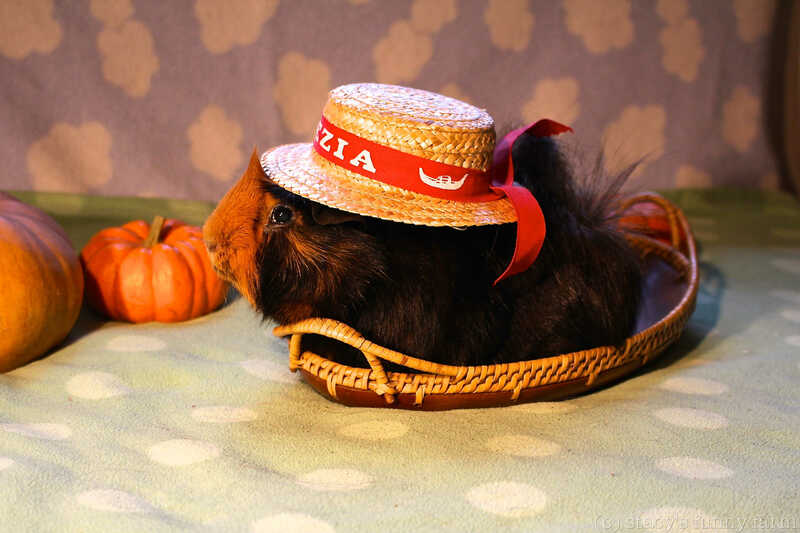 The best costume of all is actually being a cute guinea pig, isn’t it Carl? Those friends of yours certainly have better manners than Stevie Ray and Fred! That’s right, Carl. You are INNOCENT! Happy Birthday!